I hope you are well and warm, wherever you call home! I myself am doing just fine here in sunny Arizona. These past few weeks have just been the best weather in Tucson I can remember, and after this last summer's blistering heat, a cool change was just what we needed. As I've promised, I continue to keep you posted with any news concerning my book. I'm happy to announce the first copy was delivered this afternoon to yours truly! I was so excited when I got the call, and almost crashed on my way to the print shop! It's kinda surreal holding a book with my name, story and pictures plastered all over the pages, even though it is just the proof copy. Now Mary Ann and I will go over any changes in the next few days, before we resubmit it again. Hopefully after a few days it will be ready for full production. The target date for the book signing event is still the 15th of December, and I hope the books will be ready in time. If not, then I will have to reschedule for another date. Its getting close to Christmas, and that means it might have to wait until the 28th. We'll just see if they can kick it up a notch and make it to the 15th deadline. I spoke to Kay, the events coordinator at Bookman's, and she's working hard make it happen on her end. She told me December is a busy month for other local authors to release their books, and she wants to combine all the authors involved in one big event, highlighting local writers, with me as the headliner! I wasn't expecting that, but I'm all in with that idea. It's still in the planning stages, so I'll keep you updated on that event. 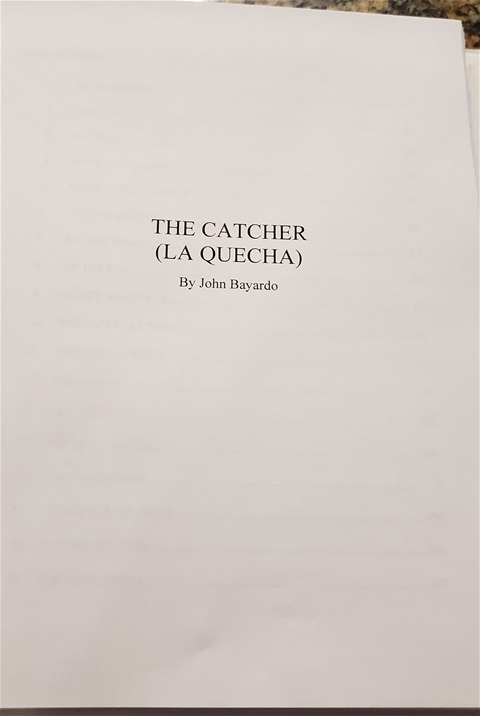 I also wanted to share the good news about my other books, including my first fiction story La Quecha, which I wrote five years ago this month. It is a border story, and part one of a trilogy I plan to complete after gigsacrossamerica part two is released next March! I plan on releasing that book online on January, and in limited print copies. I'll share more about that story as the time gets closer. Well friends, until next week, stay safe and thanks for checking in. Your interest is well recognized and appreciated!